The key to alignment is to align yourself in daily normal movement, primal movements, like standing and walking. This is change in paradigm, shifting from the medical paradigms of depending on specialists to changing your lifestyle and environment. Various forms of body work: chiropractic, physical therapy, craniosacral, massage, yoga, and a countless list of specialties can help when you are in pain or stressed and don’t know where to begin. Some of the better body workers do emotional release work energetically that can speed healing. Some will show you how to move and change normal lifestyle movement but it is rare to do it comprehensively enough. Giving exercises is not necessarily to the point. The major physical goal is alignment of bones and muscles of the entire structure from toes to teeth. It must be considered as a whole, not just the parts where pain shows up like the back or shoulders. Pain in the back can have multiple causes from feet to teeth. The standard picture of misalignment suffered by most people when standing is forward hips and forward head with the chest sunken back. Alignment is bringing the chest forward and the head and hips back. That’s booty out, chest up, it’s sexier. You cannot align yourself by “standing up straight.” You don’t know what to move and you can’t move even if you know until you have released tension of imbalanced muscles. People who “stand up straight” contract their lower back muscles, the erectors, and lean back with hips further forward, which reinforces the cause of the problem. That’s why they have to remind themselves to stand up straight. They are intervening where the symptoms show up and not in the cause that is lower down in the hips, legs and feet. Hip angle is the foundation that aligns the spine from below. The right hip angle allows the vertebrae to stack with less effort by muscles to put bones in place. With the wrong hip angle muscles have to work harder and create tension and vertebrae may pinch nerves on one side to create pain. Major causes of hip misalignment include sitting on chairs and toilets, shoes, and falling on your tailbone as a child that you may not even remember. Chairs and toilets impose a 90 degree hip angle that shortens through habit a funny pair of muscles called the psoas and illiacus that both attach to upper thigh bone or femur and then branch out to the lower back and hip bones respectively. These are called “the core of the core” abdominal and hip muscles. When you are standing these muscles can raise your knees. These muscles are responsible for aligning the hips continually as well. Proper alignment depends on these muscles being loose enough to let your hips fall back or have anterior tilt at the top, allowing you to tuck your private parts under for protection, so to speak, and stick your booty out. Normal or ancestral, primal movement includes sitting on the floor cross-legged and the primal squat with your knees up to your shoulders. These both stretch hip muscles to align the hips and allow the hips and sacrum to swing freely when walking. Tight hips and sacrum lead to the shoulders swaying like a cowboy. This may look macho and tough and take up space but these people are easier to knock over. It can take time to regain range of motion to do the primal squat or even sitting cross legged. Normal primal movement is also standing and walking with hips back with an "anterior tilt" or top of the hip leaning forward. The first step to align is to release tension in passive positions. 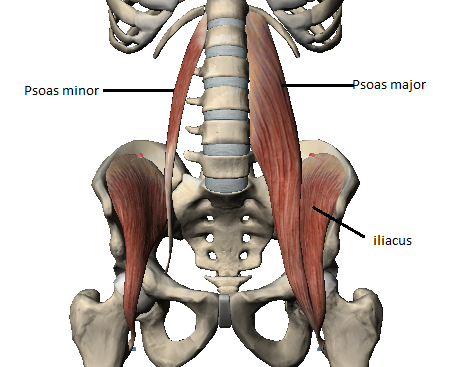 To release the illiopsoas complex involves lying down in the right positions with various techniques to put these muscles in neutral so they can rest and let go. I teach this in my Align Spine & Mind program. You can feel this up into your neck as the chain reaction of muscle tension releases. By relaxing the neck you also help the cranium expand as neck muscles attach to the temporal and occipital bones. People doing cranial and orthodontic work would do well to release hips to support expansion of cranial bones, which may be a secondary but significant obstacle to progress. Causation works both ways from top down and bottom up. The hips are that important. By releasing the psoas the relaxing effect is stronger than you can imagine and it is easy to fall asleep or just feel blissed. Many people have emotional release from this for some reason that no one understands fully; muscle tension holds in emotions, and emotions can create muscle tension. You can start at either place and intervening from both directions is more thorough. After releasing the psoas the hips will be pushed back and you can walk more smoothly. Second. Stretch muscles. Stretching before releasing can run into resistance that tears at muscle. If you are really sensitive you can just release and leave it at that. The muscles individuals need to stretch can vary but generally the posterior chain or muscles on the back side of the body: glutes, adductors, hamstrings, and erectors or lower back, will be underdeveloped and tight. It feels amazing to stretch these and get the hips further back. Third. Walk and stand properly. Normal muscle use will be different and can make you sore. It feels like you are massaging your whole body and spine when walking properly. You feel sexier with proper hip movement. People have no clue what they are missing. Joy in living can be found in these simple things, aligning with nature’s design. Fourth. Strengthen muscles with exercises, but this is not always necessary. There are many ways to do this. Yoga asana routines can help movement in a balanced way, but can also hurt if you skip the fundamentals because yoga was not designed to address modern causes of misalignment. There are several foot angles that matter, but let’s stay focused on the hips for the moment. This is what a proper solution looks like that addresses root causes as related to hips. Let’s see how different kinds of body workers measure-up to this standard. Chiropractors push bones back into place. This does not address the fact that MUSCLE MOVES BONE and hold bone in place. This is usually pure symptomatic treatment. It is often antagonistic because it forces bones to stretch tight muscles. Chiropractors can injure necks and back. The best I have heard of chiropractors are neurological chiropractors who train in movement to get results, but this does not address alignment systematically. Chiropractic is more helpful if you suffered an impact injury and they push the bones back into normal equilibrium, not away from your normal equilibrium as they usually do. They can help get you out of extreme pain but if you have to keep going back you are not getting to the root cause. The one helpful correction of an injury I had was from falling on my tailbone and having an internal adjustment done by an Osteopathic physician. Yet there was no larger strategy of realignment at that time. I learned to adjust it somewhat myself later on my own.. Most body workers never even tried to treat it even though it was in my Xrays. PTs work with muscles that move bones but they usually miss root causes in the system and often jump to the fourth level of intervention to begin by strengthening muscles. Shoulder and neck pain is analyzed in terms of the root cause of sitting. The treatment is to strengthen the muscles that pull the head back. That might help but it’s a very narrow interpretation of the problem. The structural misalignment they notice is a forward head posture. This is usually causes by hip misalignment from below that will continue after the person is standing. Why is the head position forward, hanging over the front the body? To keep a narrow airway open that would be closed with normal posture. Why is the airway narrow? The palate is narrow. Why is the palate narrow? Tongue movement and posture did not expand the palate as with normal development. Why is the tongue like that? Bottle finding rather than breast feeding. Nasal breathing for various reasons….etc. According to this logic, in these cases if the PT succeeds the patient will not be able to breathe. Most body works of all kinds do not know about root causes in the mouth and are defensive about hearing about it, they don’t want to know. These cases need orthodontics, and there are some do it yourself techniques to assist, but this is a different topic. Massage releases tension in muscles and that feels good and keeps people coming back dependently like a drug. I’ve done some of the most supposedly effective techniques like rolfing that feel amazing but it does not hold in the long run if you have serious root causes of misalignment. Massage therapists can support a broader strategy by releasing some tension and forcefully breaking up clogged tissues like lymph and adhesions to enable movement, but that movement strategy has to be in place to take advantage of temporary gains. Massage therapists could learn to teach do-it-yourself techniques and normal movement so the body can align itself. Yoga was not designed to address modern misalignment problems so people with serious issues often just can’t do it. When people are ready yoga is something you can do yourself and is well worth considering when you find the right routines for you. Much yoga is advanced but the simpler techniques are incorporated in what I describe above for people in pain and limited range of motion. Craniosacral is very interesting and the theory is very useful because it looks at a big chunk of the system: from tailbone or sacrum to the head, and not as a collective of bones, but a unified rhythm of subtle movement based on cerebral spinal fluid flow. I cannot give it justice here, but it is also holistic because it has a basis in science and incorporates energetic and emotional insight. It is light touch work to help the body regain an equilibrium. This method fits well with energetic healing by the practitioner if they know how since they are tuning into subtle things. What they miss is how the bite constrains the cranium: narrow palates that lead to crowded teeth and extractions, and short molars. And the narrow airway that leads to forward head posture and spinal curves pushed downward. They also miss the feet in aligning the hips. There is no DIY training for normal, primal movement to hold the gains of therapy and align more deeply. There is an endless proliferation of new body work systems even some that are more DIY but still miss root causes like walking properly, shoes, and cranial and orthodontic treatment. They captivate people with new technical information and develop techniques that address part of the picture at best. The field of body work as a whole functions to treat symptoms primarily and keep people coming back long term. It is almost completely lacking in real root cause analysis and suffers from narrow specialization that misses areas of the body. It accidentally functions just like the medical system by making more money on the problem repeating itself. I’m was a patient that tried many things until I found what worked. But the process was not random because I knew what a complete solution looks like before I knew the details. I did Ph.D research training in systems thinking and quality control and improvement from outside the health realm where it works better. These method are known to engineers and managers as six sigma or total quality. It is based in extending scientific theory to new levels and methods to new realms of daily problems. You need both at the same time, it’s not theory versus practice, that is backward thinking. I have a whole section on Quality Improvement for health here on my webstie. . The point is that a new way of thinking is needed for the consumer and health enthusiast to make better health decisions and I think I have illustrated that here. If you want to transform you physical and emotional alignment at the same time then read about my Align Spine & Mind program. This also include how to release your cranium. Then we can chat on video in a free consultation. If you have other health concerns I can do a free assessment of your root causes and help figure out what you should do next.